Give a stylish finish to your knitted garments and accessories with this must-have compendium of knitting know-how. 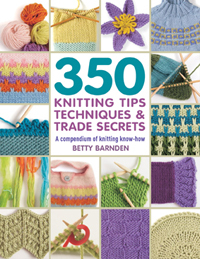 This updated edition of the hugely successful 'Compendium of Knitting Techniques' now contains over 350 tips, techniques and trade secrets, all clearly explained with step-by-step instructions, photographs and diagrams. Discover how to read patterns and charts; choose colours and yarns; mix and match stitch patterns and deal with tension variations; and adapt designs for the perfect fit. All stitches are clearly demonstrated, from stocking and ribbing to lace, Fair Isle, cables and intarsia work. All the techniques you need are explained, in the order you need them, from casting on and joining in yarns to adding buttonholes, pockets and embellishments. 'Try it' and 'fix it' panels suggest ways of practising and developing new skills and avoiding or correcting common knitting errors. This is the essential go-to knitting guide that you will turn to again and again.